H-Bond PVA adhesive and cement mix dries clear, is able to be painted and its low pH means no discolouration on tannin rich timbers. No mixing is required to achieve excellent performance properties for repairs or building projects. Able to be sanded without clogging the sand paper. 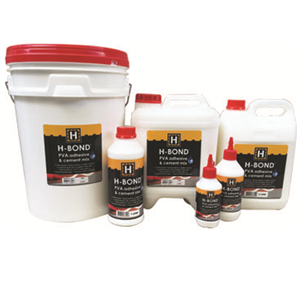 H-Bond PVA adhesive and cement mix is suitable for exterior and interior use in nonstructural applications. Resistant to 110 degrees celsius, it will not weaken on exposure to direct summer sun. Ideal for many timber projects around the home and in the workshop, it is not suitable for joints below a water line or continuous submersion applications. Its other benefits include being weather resistant, for woodworking and craft, sandable, water clean up, cement bonding agent and improves cement workability. White adhesive will dry to clear. Coverage Mix 1 part of PVA to 10 parts water then add to dry cement mix. Clean Up Clean equipment and hands with warm soapy water. Should spills occur, wash up with warm soapy water. IMPORTANT Keep out of reach of children. To avoid spoilage of adhesive keep container sealed when not in use. Poison Information Centre (13 11 26).